Full menu available while kitchen is open all day. 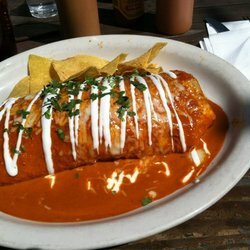 Choice of Small (10”) or Large (12”) sized flour tortilla filled with Spanish rice, whole pinto beans, jack & cheddar cheese, sour cream, avocado slices, pico de gallo & your Choice of Meat. Make it “Wet” Smothered in melted cheese, sour cream & our famous Red (or Green) Enchilada Sauce. Extra tasty! Choice of Small (10”) or Large (12”) sized flour tortilla filled Beer battered cod, cabbage, rice, whole pinto beans, pico, cheese & our white sauce. No Meat! Choice of Small (10”) or Large (12”) sized flour tortilla filled rice, whole pinto beans, cheese, pico, sour cream & avocado slices. Flour tortillas filled with your Choice of Meat & jack cheese then smothered in our homemade enchilada sauce & cheddar cheese. Served with refried black beans & Spanish rice on the side. Lightly seasoned tater tots served with chipotle ranch. Seven deep-fried breaded jalapeños filled with cream cheese. Served with dipping sauce. 3 deep fried jalapeños with lime & salt. Hot! Pork, hominy, celery, carrots, onion, avocado slices. Topped with cheese & crumbled corn chips. Vegan Cheese Quesadilla V. VG. Chips & Salsa Fresca V. GF. Guacamole & Chips V. GF. Black Bean Dip VG. GF. Rice & Beans V. VG. GF. Whole pinto beans or refried black beans. Arbol chiles, Roma tomatoes & garlic. (you can order Single Tacos) V. VG. GF. 3 on soft white corn tortillas. Meat Choice, onions, cilantro & slices of avocado. 3 on soft white corn tortillas. Piled high with cheese, lettuce, rice, whole pinto beans, onions, avocado slices & black olives. 3 on soft white corn tortillas. Shrimp sautéed in tequila, lime, garlic & chipotle peppers. Rice, lettuce, avocado slices, onions & cilantro. Spicy! Beer battered cod, cabbage, our white sauce & pico. 3 on soft white corn tortillas. 3 on soft white corn tortillas. Grilled Cod, cabbage, pico & spicy avocado lime sauce. A fried flour tortilla bowl filled with rice, refried black beans, lettuce, pico, olives, cheese & avocado. (you can order Single Tostada ) V. VG. GF. 3 fried corn tortillas topped with refried black beans, lettuce, cheese & pico. Sirloin steak grilled to perfection! It’s green. Slowly simmered in garlic until tender in our verde sauce. This one is red. Slow simmered with caramelized onions, roasted tomatoes & other things we won’t tell you about. Pulled pork simmered with garlic & onion. Pork marinated with dried chilies, spices & orange juice. Grilled with fresh pineapple. Morning Star ‘Fake Meat’ VG. Morning Star Sausage Patties a bit like chorizo but not spicy. Vegetarian. 100 % Vegan Meats Made by Gardein, prepared like our other meat options. Be sure to specify ‘vegan meat’ to your server!